Blot of bovine retinal extracts probed with ABIN1580458. 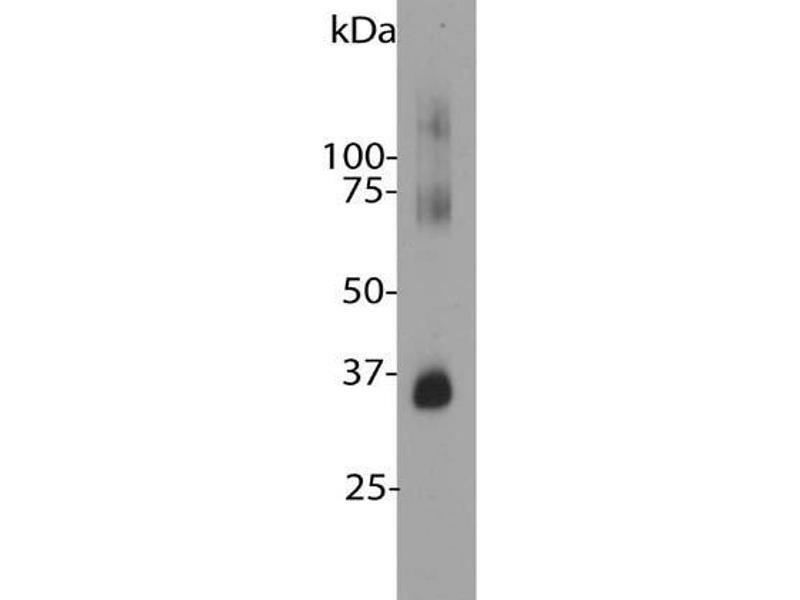 The antibody stains a band corresponding to retinal rhodopsin at about 35 kDa. Bands about 70 kDa and 140 kDa are aggregated forms of rhodopsin. Note, due to the highly hydrophobic nature of rhodopsin, it important to avoid boiling samples containing this protein it in SDS-PAGE sample buffer, as this will result in even more extensive aggregation of the rhodopsin protein and appearance of more of this high molecular weight material. High magnification confocal image of pig retinal section stained with ABIN1580458 (Green). 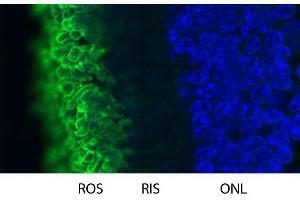 Rhodopsin is most abundant in the rod outer segments (ROS) of retina, clearly localized in rod membranes. The rod inner segments (RIS) and rod nuclei in the outer nuclear layer (ONL) are also seen in this image. Nuclear DNA was stained with DAPI (blue). Background Rhodopsin is the protein in the mammalian retina responsible for the light sensitivity of rod cells, which are responsible for vision in low light levels. Somewhat surprisingly, the rhodopsin protein turned out to be a typical member of the seven transmembrane G protein-coupled receptor (GPCR) superfamily. Whereas other GPCRs initiate signaling on binding a specific ligand, rhodopsin exists with a ligand already bound, specifically the vitamin A related substance retinal. Retinal can exist in two isomeric forms, 11-cis and 11-trans retinal. In the dark rhodopsin is associated with 11-cis retinal, but photons cause the 11-cis form to flip to the 11-trans form, and this causes an alteration in the structure of the rhodopsin making it catalytically active. 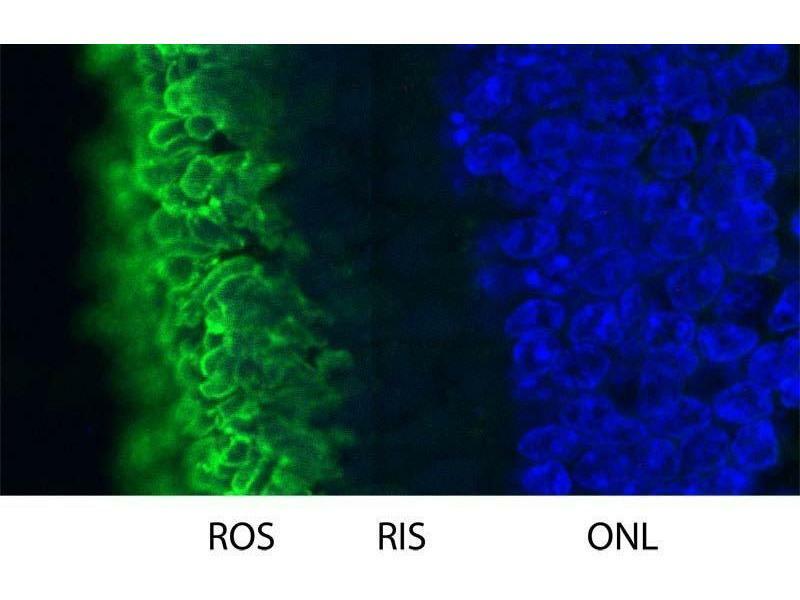 Activated rhodopsin in turn activates the GTP binding protein transducin by favoring the loss of GDP and the addition of GTP. Transducin is a typical member of the family of heterotrimeric G proteins, and consists of an alpha, and a beta,gamma, subunit. The alpha, subunit is responsible for the GTP binding and the GTP bound form activates a phosphodiesterase (PDE) enzyme which hydrolyses cyclic GMP. This in turn results in the closure of cyclic nucleotide gated ion channels in the rod cell membrane, which prevent the influx of sodium and calcium ions. This results in an increase in the membrane potential of the rod cell and so reduces the rate of synaptic signaling. So light stimulation results in a reduced rate of photoreceptor synaptic release. This information is transmitted through neurons of the retina to the visual centers of the brain (see review 1, 2). Rhodopsin activity is shut off by phosphorylation under the influence of rhodopsin kinase, the activity of which results in binding of visual arrestin, which prevents rhodopsin from interacting with and activating more transducin molecules. This basic signaling paradigm proved to be a prototype for understanding how other GPCRs function, as proteins similar to transducin, arrestin and rhodopsin kinase are found in these pathways. MCA-B630 was raised against bovine outer segment discs and shows convincing staining for rhodopsin both on western blots and on sections of retina. The protein is concentrated in rod outer segments. The HGNC name for this protein is RHO. Application Notes Try at dilutions of ~1:1,000 for immunofluorescence. For western blots try at 1:5,000. A suitable control tissue is retinal extracts. Rhodopsin run at 35 kDa on SDS-PAGE gels. Storage Comment Store at 4°C short term or -20°C long term.